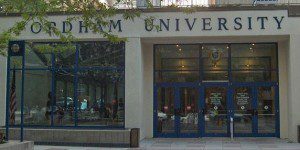 The Fordham full-time MBA at the Gabelli School of Business curriculum was thoroughly redesigned in 2014 to suit the current job market and the needs of its employers. The streamlined 60-credit full-time program takes two years to complete. It follows a cohort structure, meaning that full-time MBA students take all of their courses together–helping them to make strong connections with each other and build their professional networks throughout the program. As well as the regular fall and spring terms, students also participate in a pre-term orientation, a winter intersession each year, and a summer term that consists of an internship. The winter intersession of the first year, which happens in early January, involves an immersion experience in New York City. Over the course of five days, students are exposed to a number of company visits with corporations like Deutsche Bank, Money.net, and Hewlett Packard. They also participate in team-building and leadership activities such as a session at the FDNY Training Academy. Fordham offers seven MBA concentrations, plus several secondary concentration options. Students who pursue secondary concentrations take three more classes in total. Concentrations include Accounting, Communication and Media Management, Finance, Information Systems, Management, Marketing, and Public Accounting. If they do, their major comprises 15 credits and nine credits are electives. If they do not choose to major in a particular subject, 36 credits are comprised of core classes and 24 are electives. Students who choose a secondary concentration have 36 credits of core classes, and 15 credits of each major. Some students also choose a major and a minor, in which case core classes comprise 36 credits, the major comprises 15 credits, and the minor makes up nine credits. Nearly 62 percent of the Gabelli MBA program identify as male, with 38 percent of students identifying as female. International students make up around 32 percent of the most recent class. The average GMAT score of admitted students is 622. Students enter at an average age of 28 and have more than five years of professional work experience. The average base salary of Gabelli MBA students is $97,404 and a signing bonus of $21,667. Tuition for the Fordham full-time MBA program tuition is $93,150. Students should also factor housing costs into their financial considerations. Full-time students are eligible for a number of need- and merit-based scholarships. These include the Hitachi Minority Scholarship for minority students; the Emily L. and Robert E. Smith Scholarship for female students pursuing international studies; and the Linda Perrin Taber Pollack and Roy Howard Pollack Scholarship for second-year students demonstrating academic merit and financial need. Additionally, full-time MBA students are eligible to apply to work for a Fordham graduate business faculty member under the Graduate Assistantship Program, receiving partial tuition payment in remuneration for their work. Students may work 10 hours per week per term for $3,510 in tuition remission or 20 hours per week per term for $7,020 in tuition remission. However, students can only participate in a maximum of six 10-hour or three 20-hour assistantships over the course of their studies, capping the total tuition remission a student may earn at $21,060. Fordham graduate students are eligible for both Federal Direct Unsubsidized Loans and Federal Direct Graduate PLUS Loans. Students are also eligible for an array of private loans, which typically require a creditworthy U.S. co-signer. In addition, Fordham’s Office of Admissions offers the Fordham GBA Loan to students who need to supplement other government or private loans. These $5,000 loans are awarded based on merit and need and are available for domestic students enrolled in at least six credits at the time of their loan application. Students may only be awarded one GBA Loan over the course of their studies at Fordham. Fordham requires that applicants have a minimum of two years of work experience to gain admission to the full-time MBA program. There are no minimum GPA or standardized test score requirements for admission. Applicants to the Fordham full-time MBA program are required to submit an online application, undergraduate and (if applicable) graduate transcripts, official GMAT or GRE scores, two professional letters of recommendation, a professional resume, two essays about their professional goals and aspirations and a $130 application fee. International applicants submitting undergraduate or graduate transcripts must also submit a third-party evaluation of the transcripts. International applicants must also submit TOEFL or IELTS exam scores—minimum scores of 600 on the TOEFL or 7 on the IELTS -are required. If international students score below these cutoffs, they may be required to take the English as a Second Language (ESL) proficiency exam.